Tangles are based on the concept of infinity and continuous motion. This “Magic in the Motion’ that you feel when you play with a Tangle is truly therapeutic and calming to the soul! Once you put a Tangle in your hand, you just can’t put it down! A Tangle is more than just a toy. It is twistable energy that enables a free flow of creativity from your mind. Technically, a Tangle is a series of 90-degree curves, connected and able to pivot at each joint. It has no beginning and no end – just continuous motion! 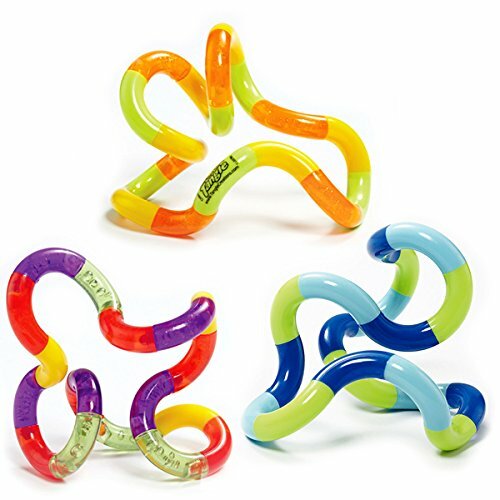 “That fun, twisty thing!” Tangles have endless uses and serve a variety of different purposes. It can be a puzzle, a movable sculpture, a desktop toy, a fidget, a brain tool, an anti-stress device, a teacher supply, or even a cosmic art toy with special powers! The possibilities are limitless! Tangles are fun to look at, fun to hold, fun to twist, turn, and manipulate. Tangles are appealing to all ages, to boys and girls alike, and even adults. Tangles offer a hands-on art experience. Tangles bring out creativity and artistic imagination! Tangles are silent and calming. They do not disturb or disrupt others. Tangles are safe, reusable and affordable. Please note: Colors may vary. Due to separating segments, the Tangle Jr. is a choking hazard for children under the age of 3.